The department of Surgery was started in the hospital by Dr. N.D. Jeyasekharan; one of the few surgeons with an FRCS degree in the 1960’s. For 20 years he was the sole surgeon looking after General Surgery, Trauma, Gynaecological and Urological surgery. Dr.G.Reghuvaran who performed the Tonsillectomies, Mastoidectomies and the locally prevalent Rhinosporodiosis cases, helped him. Dr.N.D.Jeyasekharan was later joined by his sons Dr. Sabu Jeyasekharan and Dr. Devaprasath Jeyasekharan after which he left the department (though still in his prime) in their able hands. Starting with one operating room in 1967, the new OR complex was built in 1987 which now consists of three large Operating Theatres and one minor Operating Theatre upstairs (Upstairs OR) and two Operating Theatres downstairs (Downstairs OR). The Downstairs OR is upgraded to do major Endo urology and Orthopaedic surgeries. ESWL machine added in 1998. GI Endoscopy with Olympus Videoscopes and Bronchoscopy is done in the other theatre. Upstairs OR complex have been updated with new tables, lights, Anaesthesia machines, Heart lung machines, Cautery machines etc. HD Stryker Laparoscopic system and Gyrus vessel sealing machine are also added. The new OR complex called Wound Care Centre (W.C.C.) 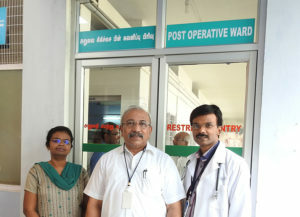 was inaugurated by Dr. N.D.Jeyasekharan in December 2005. It has a major OR, a minor OR and a dressing area. This OR complex is separate from the other OR areas. Here infections are kept to a minimum. The Surgical ICU has 6 beds with monitors, portable X ray, Scan and ventilators. The most common emergencies are RTA (Road traffic accident) and GI bleeding. Once patients are stabilized they are shifted towards surgery. GI bleeding is a very common emergency following febrile illness, cirrhosis of liver and in cardiac patients. Dr. Judson, Dr. Bala and Dr. John are some of the very capable who do most of the routine surgeries, both open and laps. Dr. John. A.C. Thanakumar, M.S, F.R.C.S., chief surgeon of Global Health city, Chennai does advanced Laparoscopic surgeries. Our hospital was the venue for the workshops conducted by A.S.I. Tamil Nadu chapter. Open hernias to Laparoscopic Adrenalectory were done successfully. A live telecast was done to a nearby auditorium. 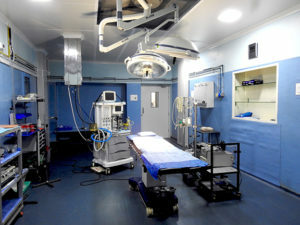 The surgical outpatient department sees a wide variety of simple and complicated cases and diagnostic ultrasonography is encouraged as a part of basic clinical work up of surgical patients in the hospital; particularly of use in management of acute abdomen, liver abscess and in trauma. 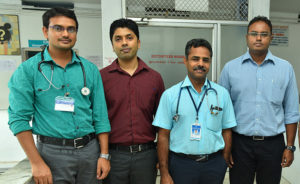 Most of the general surgeons who have worked in Jeyasekharan Hospital have also become good sonologists in emergency situations. A new ultrasound machine was installed in Surgical O.P.D in 1996 and a scan machine is available in the MICU also. The Surgical registrars can regularly present reports at the local A.S.I. meetings and at the hospital. They also attend C.M.E. meetings at C.M.C. Vellore and Medical College, Madurai. Dr. Jeyasekharan Hospital was the venue for the C.M.E. conducted by National Board (General Surgery) and also we also successfully conducted the D.N.B exams in General Surgery twice, each lasting for 4-5 days. Dr. D.D.J was the head coordinator and Dr. S.S.J was the examiner both at the hospital and at Indore. Several Visiting Surgeons come to the department on a regular basis for complicated open and Laparoscopic surgeries.